Systematic risk is that part of the total risk that is caused by factors beyond the control of a specific company or individual. Systematic risk is caused by factors that are external to the organization. All investments or securitiesStockWhat is a stock? An individual who owns stock in a company is called a shareholder and is eligible to claim part of the company’s residual assets and earnings (should the company ever be dissolved). The terms "stock", "shares", and "equity" are used interchangeably. are subject to systematic risk and therefore, it is a non-diversifiable risk.Equity Risk PremiumEquity risk premium is the difference between returns on equity/individual stock and the risk-free rate of return. It is the compensation to the investor for taking a higher level of risk and investing in equity rather than risk-free securities. Systematic risk cannot be diversified away by holding a large number of securities. Systematic risk includes market risk,Market Risk PremiumThe market risk premium is the additional return an investor will receive (or expects to receive) from holding a risky market portfolio instead of risk-free assets. The market risk premium is part of the Capital Asset Pricing Model (CAPM) which analysts and investors use to calculate the acceptable rate interest rate risk, purchasing power risk, and exchange rate risk. Market risk is caused by the herd mentalityHerd MentalityIn finance, herd mentality bias refers to investors' tendency to follow and copy what other investors are doing. They are largely influenced by emotion and instinct, rather than by their own independent analysis. This guide provides examples of herd bias of investors, i.e. the tendency of investors to follow the direction of the market. Hence, market risk is the tendency of security prices to move together. If the market is declining, then even the share prices of good performing companies fall. 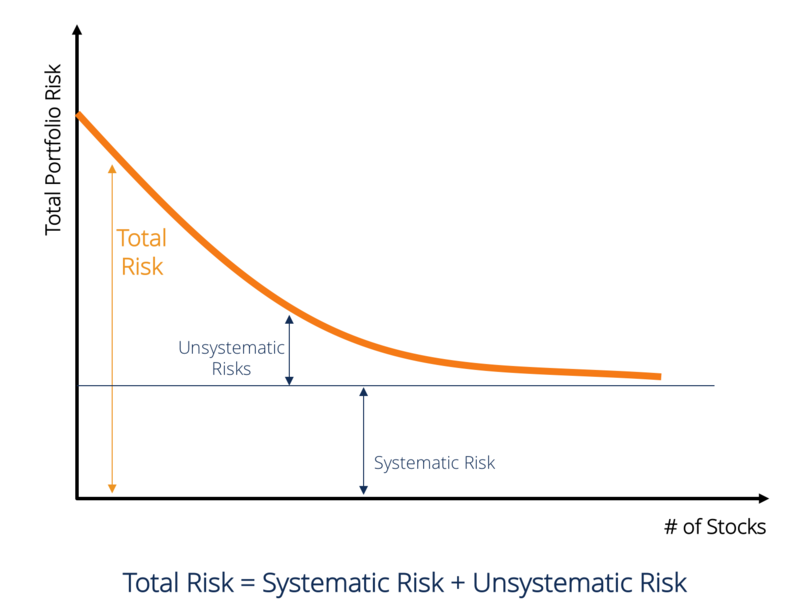 Market risk constitutes almost two-thirds of total systematic risk. Therefore, sometimes the systematic risk is also referred to as market risk. Market price changes are the most prominent source of risk in securities. Interest rate risk arises due to changes in market interest rates. In the stock market, this primarily affects fixed income securities because bond prices are inversely related to the market interest rate. In fact, interest rate risks include two opposite components: Price Risk and Reinvestment Risk. Both these risks work in opposite directions. Price risk is associated with changes in the price of a security due to changes in interest rate. Reinvestment risk is associated with reinvesting interest/ dividend income. If price risk is negative (i.e. fall in price), reinvestment risk would be positive (i.e. increase in earnings on reinvested money). Interest rate changes are the main source of risk for fixed income securities such as bonds and debentures. Purchasing power risk arises due to inflation. Inflation is the persistent and sustained increase in the general price level. Inflation erodes the purchasing power of money, i.e., the same amount of money can buy fewer goods and services due to an increase in prices. Therefore, if an investor’s income does not increase in times of rising inflation, then the investor is actually getting lower income in real terms. Fixed income securitiesFixed Income SecuritiesFixed income securities are a type of debt instrument that provides returns in the form of regular, or fixed, interest payments and repayments of the principal when the security reaches maturity. These instruments are issued by governments, corporations, and other entities to finance their operations are subject to a high level of purchasing power risk because income from such securities is fixed in nominal terms. It is often said that equity shares are good hedges against inflation and hence subject to lower purchasing power risk. In a globalized economyMarket EconomyMarket economy definition - a pure market economy is an economic system where there are no regulations and players are free to trade as they please, most of the companies have exposure to foreign currency. Exchange rate risk is the uncertainty associated with changes in the value of foreign currencies. Therefore, this type of risk affects only the securities of companies with foreign exchange transactions or exposures such as export companies, MNCs, or companies that use imported raw material or products. RS is the return on a particular security while RM is the market return. It can be observed that β is the regression coefficient of RS on RM. The intercept term α shows a security’s return independent of market return. 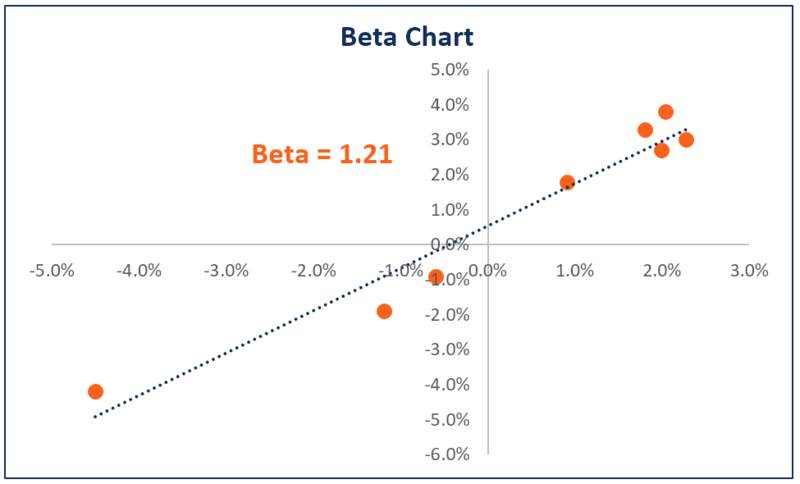 The Beta of a stock or portfolio measures the volatilityVolatilityVolatility is a measure of the rate of fluctuations in the price of a security over time. It indicates the level of risk associated with the price changes of a security. Investors and traders calculate the volatility of a security to assess past variations in the prices of the instrument compared to the overall market volatility. It is used as a proxy for the systematic risk of the stock, and it can be used to measure how risky a stock is relative to the market risk. When used as a proxy to measure systematic risk, the β value of a portfolio can have the following interpretation. When β = 0 it suggests the portfolio/stock is uncorrelated with the market return. When β < 0 it suggests the portfolio/stock has an inverse correlation with the market return. When 0 < β < 1 it suggests the portfolio/stock return is positively correlated with the market return however with smaller volatility. When β = 1 it suggests that the portfolio return has a perfect correlation with the market portfolio return. When β > 1 it suggests that the portfolio has a positive correlation with the market, but would have price movements of greater magnitude.